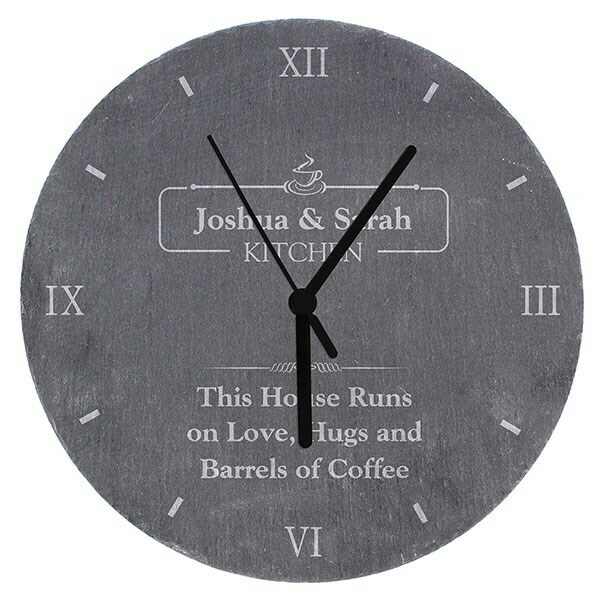 Rustic slate clock embellished with speckles of fool’s gold. Includes the word ‘KITCHEN' inside a decorative banner ready to add any name/s up to 18 characters, plus space for a 3-line message (up to 21 characters each line). Please note: as the slate is cut by hand, it will have its own unique texture and rustic finish. All personalisation is case sensitive and will appear exactly as provided. 1. Pay for your item. 2. We'll send you an email requesting your personal message. Please provide the details exactly as you would like them to appear, as gifts cannot be amended or returned after personalisation. 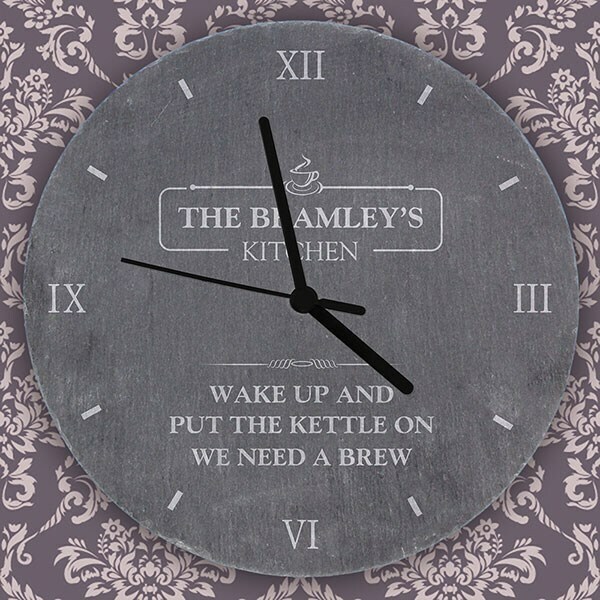 For next day delivery, your order must be placed by 11am and we must receive your reply by 12 noon. 3. Next day delivery items ordered as above will arrive the next working day (excluding weekend orders, which will be processed on Monday for Tuesday delivery). For standard delivery items, please allow up to 5 working days after we receive your reply. Named day delivery is not available on this item. Please select our £4.99 Standard Delivery when checking out, regardless of your preferred delivery method. Next Day Delivery items have been priced to include the small extra charge for our next day service.